The sides of the trinagle BDG equal 2/3 of the corresponding medians. Its area is clearly 2/6=1/3 area of ΔABC. 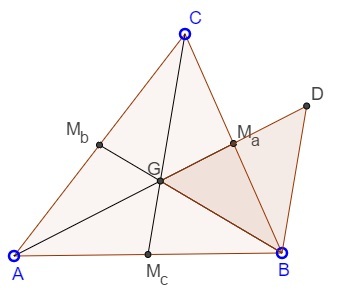 Thus the area of the median triangle (the triangle composed of the medians of ΔABC) equals (1/3)(3/2)²=3/4 that of ΔABC. The assertion is a particular case of a more general statement. There is also another simple way to obtain this result.